Members of the Caithness Countryside Volunteers were pleased with the dry weather on Sunday morning as they were busy painting the second coat of wood preservative at the Loch of Mey bird hide. 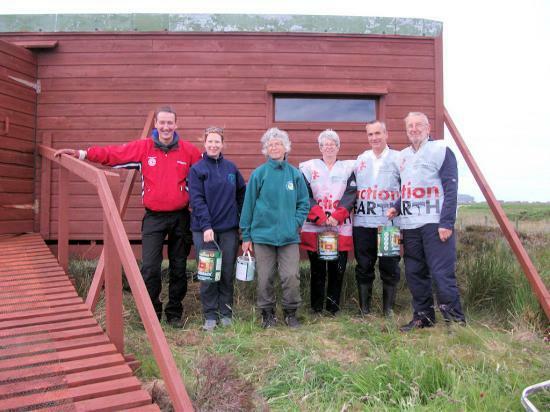 The local Scottish Ornithologists' Club (SOC) were fortunate to access a grant from the Action Earth Awards to pay for the wood preservative, brushes, wood and guttering to undertake vital repairs at the bird watching facility. The event was part of a campaign called CSV Action Earth organised by CSV (Community Service Volunteers). 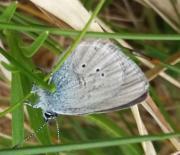 As part of this year's campaign, Scottish Natural Heritage is supporting around 160 projects in Scotland through grant awards of up to £500, aimed at groups that will help support and encourage volunteer activity through practical environmental projects. Members of the SOC had previously painted the first coat and had undertaken repair works to guttering and internal wooden fixtures. The Caithness Countryside Volunteers helped complete the project on Sunday when they finished the second coat of preservative and painted areas inside the hide to display new bird identification charts. Marina Swanson, Highland Council Ranger and Caithness Countryside Volunteer chairperson said: "We are very pleased with the grant from Action Earth as it was sufficient to pay for materials to carry out this project. It is great to have groups working together to improve an environmental facility for the benefit of the whole community. My many thanks to the volunteers who gave up their time to assist with the work."